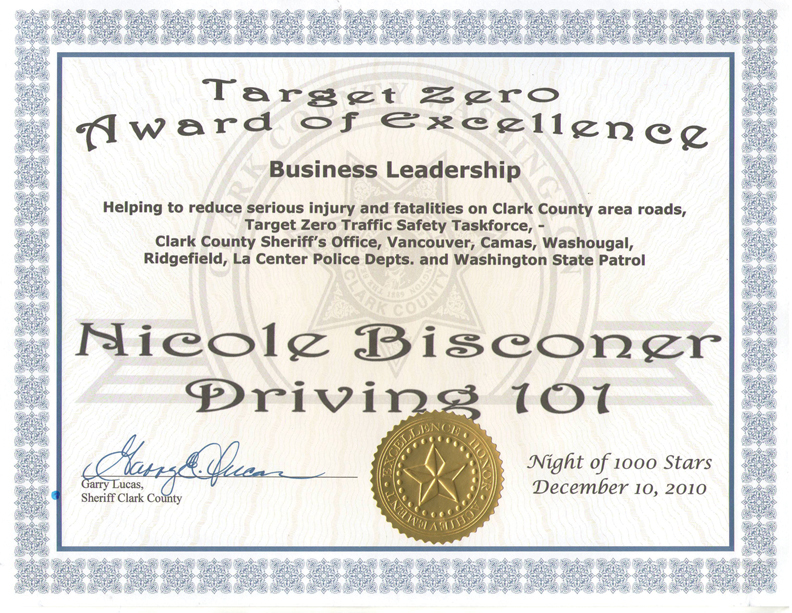 Clark County Target Zero traffic safety taskforce awarded Nicole Bisconer, owner of Vancouver’s own Driving 101, its Business Leadership Excellence award at the December 10, 2010, Night of a Thousand Stars. The award was given to Bisconer for Driving 101’s continued help with projects and support with volunteers, traffic safety and law enforcement through policies and procedures within our community. Bisconer has operated DRVN 101 since 2006 with a dedication to ensuring each teen student has a grasp of the realities and dangers associated with driving, as well as the consequences of driving drunk. Bisconer is active in the local community, partnering with local businesses, schools and law enforcement. She has also participated in and organized safety fairs centered on driving safety. The Night of a Thousand Stars is dedicated to the families and friends whose lives have been permanently impacted by an impaired driver. The Target Zero taskforce includes: The Clark County Sheriff’s office, The Vancouver, Camas, Washougal, Ridgefield and La Center Police Departments, WSU Vancouver and the Washington State Patrol’s Commercial Vehicle division. The taskforce’s goal is to reduce fatalities and serious injuries caused by impaired drivers to ZERO by 2030. Did you know that the frontal lobe of your brain, responsible for decision making, doesn’t fully develop until age 25? Nicole Bisconer does, and she strives to give every teenager looking to get behind the wheel the tools they need to stay safe during this pivotal part of their driving career. As the owner of Driving 101, Nicole instructs in a way that balances this inherent lack of fear by ensuring her students gain knowledge and experience in a fun environment. Nicole founded Driving 101 in Vancouver in 2006 and admits to being a “driving junkie” who loves helping teenagers be safe on the road. A resident of Clark County, most of Nicole’s extracurricular time is spent at basketball practice with her 14 year old son and 10 year old daughter. Inc. Magazine says Driving 101 Driving School is #1 in Washington State!